Ohio high school students can earn recognition by showing they are prepared to contribute to the workplace and their communities. 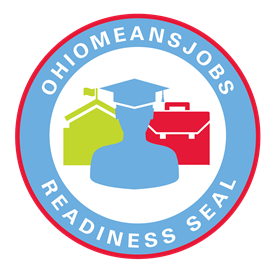 The OhioMeansJobs-Readiness Seal is a designation for high school students who have demonstrated that they are ready for the next step in their career path. Mentors give students first-hand information on what it takes to be successful in the next step of their career path! Schools and educators play a vital role in students earning the Ohio Means Jobs Readiness Seal. We are very pleased to support the OhioMeansJobs-Readiness Seal and excited to be launching the AEP Opportunities iN Energy program. Opportunities iN Energy will provide students with work experience and education opportunities that could lead them to a career at AEP in less than two years. Everybody wins with this program. Today, it means more opportunities for deserving students. In the future, it means better educated and more engaged members of our communities, as well as a better prepared and more skilled workforce for companies like ours. As an employer in Northeastern Ohio for over 50 years, we understand firsthand the challenges and barriers that many faces in gaining employment, particularly coming out of high school. This program provides a strong first step in the direction of ensuring that high school graduates are well prepared for their next steps in life – employment, post-secondary education or training, or both. We are constantly striving to bridge the gap between construction job demand and qualified workers. The Ohio Means Job Readiness Seal, will be a great asset to us as we continue our efforts. The merits of the Seal, as well as personal development through the use of mentorship/coaching, closely reflects values that Kokosing works to demonstrate daily and will help us greatly in preparing the construction workforce of the future. Mark OsbornCorporate Field Workforce Manager - Kokosing, Inc.
Ohio high school students can earn recognition by showing they are prepared to contribute to the workplace and their communities. Students can earn the OhioMeansJobs-Readiness Seal on their high school diplomas and transcripts indicating they have the personal strengths, strong work ethic and professional experience that businesses are looking for. To earn the OhioMeansJobs-Readiness Seal, motivated high school students must demonstrate certain professional skills that relate to success in the workplace. Students work with at least three experienced and trusted mentors who verify the demonstration of these skills in school, work or the community. By becoming the student’s mentor, the mentor is recommending the student to future employers and/or institutions of higher education based on that student’s demonstration of professional skills. The OhioMeansJobs-Readiness Seal shows that the high school graduate has demonstrated that they are ready for the next step in their career path, whether in the workforce or the postsecondary classroom. The OhioMeansJobs-Readiness Seal is based on a list of 15 professional skills created by business leaders in Ohio. Ohio businesses have reported a gap between the skills they seek and the skills applicants have, placing the professional skills listed below in high demand. Drug-Free - The student commits to being drug-free. Work Ethic - The student has positive work habits, personal accountability and a determination to succeed. Discipline - The student follows guidelines, demonstrates self-control and stays on task. Critical Thinking/Problem-Solving - The student uses strong decision-making skills, evaluates issues effectively and thinks creatively to solve problems. Leadership - The student uses the strengths of others to achieve common goals. He or she coaches and motivates peers and can prioritize and delegate work. Oral/Written Communications - The student expresses thoughts and ideas clearly and effectively in written and oral forms. Digital Technology - The student has an in-depth understanding of emerging technology and uses technology to solve problems, complete tasks and accomplish goals.